Richard Nixon (a name synonymous with scandal and deception) is, in broad, populist terms, known for his role in the Watergate scandal and having some choice prejudices captured on secret recordings he kept for his "file." He's associated with the unintentionally ironic statement, "I'm not a crook," and is often portrayed as sweaty, deceptive and lacking in any sort of self-awareness, being yet another American representation of disillusionment and idol disappointment during a turbulent time. 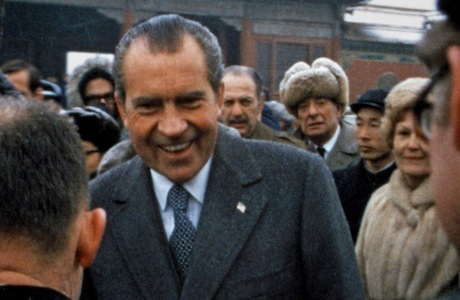 Penny Lane's documentary, Our Nixon, doesn't necessarily try to debunk any public perceptions of the notorious figure, but it does have access to the abundance of Super 8 Videos shot by his team of aides, which have been locked in a vault for decades. This intimate documentation gives some visual context and aesthetic background to the notorious audiotapes, which, as played throughout this doc, reveal duplicity and collusion as much as insecurity, ignorance and adolescent social relations on the part of the president. His constant need for validation and inherent misanthropy, only confiding in select people about specific things, speak for themselves, revealing dysfunction via petty gossip and a hypocritical guiding arm. Though the story is framed with the disclaimer that it isn't intended to provide a definitive opinion or shed light on its subject, archival news footage and home videos detail the president's history from beginning to end, giving a general impression of a conflicted identity. Before things get too serious, Lane injects comic, stylized introductions to his team of aides — John Ehrlichman (Assistant to the President for Domestic Affairs), H.R. Haldeman (Chief of Staff) and Dwight Chapin (Deputy Assistant) — capturing the youthful whimsy and wide-eyed excitement of obtaining one of the most important jobs in the world. Interview footage with these aides from the '70s and '90s helps give a sense of foreboding to the linear progression, juxtaposing their smiling faces and assertions that working in the White House was actually riotous and fun with laments of regret and guilt after the fact. Lane is careful to include recordings and comments that detail a complicated man who, at times, knew how to handle issues with shrewd practicality. Eventually, the recordings devolve into rants about homosexuality as a socialist attack on American values, citing the decimation of Greek culture as a result of Aristotle and Socrates being "fags," but before this and the many discussions about Watergate examine his downfall, Nixon's imperfections don't appear to be entirely bad. He, like most people, considers himself an intelligent and moral person, encouraged by positive feedback and hurt by criticisms. A recorded conversation of him boasting about a television speech, only to become bitter and defensive after Ehrlichman reads him a negative review amidst a sea of positivity, reveals a quiet, boyish hurt in a man that simply wants to be admired.